Honda initially sneak-previewed the Civic Tourer in the 2013 Geneva Auto Show in August but fully revealed the car in all its glory, at the 2013 Frankfurt Motor Show. Designed by the Honda design studios in Europe, this model is expected to go on sale in Europe in early 2014 and is being considered for South African soil soon after the European launch date. The Honda Civic Tourer’s overall look is stylish, sleek, stronger and sportier: a look that you don’t typically find in car manufacturers with cars in the SUV range. Adrian Killham, Chief Engineer of the Civic Tourer noted that recently launched cars tend to follow a similar sedan style. He says that The Civic Tourer has a different balance and appeal altogether. One of the car’s many impressive features is the trunk space that it offers, boasting an extraordinary trunk volume of 624 litres with rear seats up, measured up to the tonneau cover and 1668 litres with rear seats down, measuring up to roof lining. This model will comes with two engine options, either Honda’s 1.6 i-DTEC engine, from the Earth Dreams Technology, or the 1.8 i-VTEC engine in manual or automatic, giving remarkable balance of fuel economy and driving functionality. Honda also introduced the Adaptive Damper System in the Honda Civic Tourer and it comes in three settings - normal, comfort and dynamic. The first time a rear adaptive damper system has been introduced on a production car: all to improve steadiness and ease under changing load and driving environments. In other new Honda news from the Frankfurt Motor Show, Honda revealed the Acura NSX Sport Hybrid concept supercar. This exquisite machine is a ‘Sport Hybrid Super-Handling All-Wheel-Drive' system, with three electric motors: two powering the front wheels and the third, with a seven-speed dual-clutch transmission and 3.5-liter V-6, helps power the back wheels! The latest Acura NSX concept made its preview debut earlier in the year at the 2013 Detroit Auto Show. 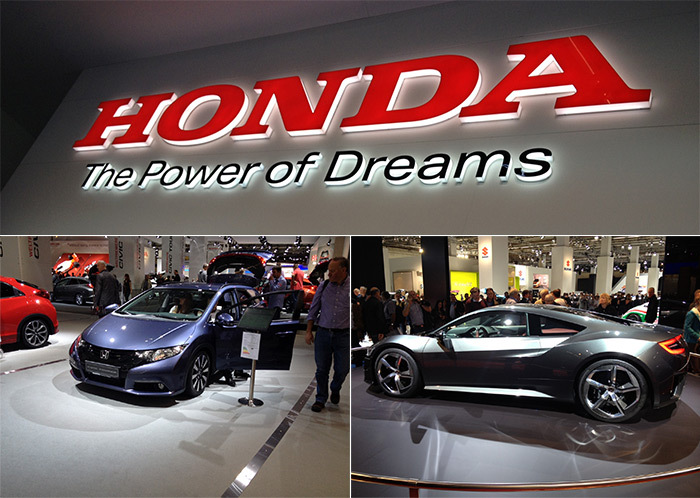 Honda officially announced that the first production model will be out in 2015 and will be manufactured in Marysville, Ohio. The 2015 Acura NSX will be built manually outside Japan and is the first special sports car model by Honda. There isn’t yet word of the Acura NSX making its way to South Africa, but we’re crossing fingers it does. The 2013 Frankfurt Motor Show brought some magnificent Honda cars and concepts and we will be delighted to welcome the Honda Civic Tourer to South Africa.